« Full Blood Super Blue Moon, Total Eclipse in Leo! 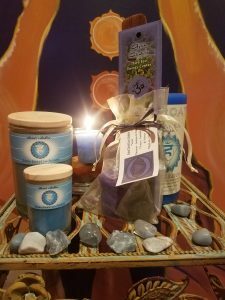 Throat Chakra Healing – Speak Your Truths! There are times in life that you may feel stifled by all the banter out there, being told what to do by other people who control your level of pay. Money isn’t the most important thing in life but it is the rules we live by from the material world. It is a sentiment of almost hitting a brick wall, not feeling able to express yourself properly out of fear. This could really pertain to any situation – maybe as a romantic relationship, or a family incident causing stress – it can be whatever you insert within the space that makes you feel incapable of expressing your true beliefs, wants, and ideas. This is problematic, because our frame of mind is only showing us one reality, when in actuality, this is not the case. If you express yourself and you feel that things are falling apart because of it, let it all fall. This is helping you shed anything and anyone that doesn’t align with your highest truth! This is part of our ascension and what we call into being. If we pretend to be fake, then we are not resonating with our true feelings and emotions. Therefore, everything we are affirming and attracting will be counterfeit. Stating your raw and real truths isn’t always easy, but we need to understand that this is a necessary part of our growth spiritually. Where are you trying to go on your journey? Who are you becoming? These are important questions to ask yourself when you look in the mirror because how we express ourselves, cultivates our identity. How we talk to ourselves also says a lot about the reality we are experiencing. When we have self-doubt, and talk down about ourselves it shifts the vibrational energy – creating negativity. This can block not only your throat chakra, but your sacral chakra – causing a blockage of creativity and birthing of ideas. Ultimately, we need to understand that EVERYTHING is connected. When you speak, account for what your mind says, but also what your heart says. Intention is everything and when you put your intent out there, it will manifest into reality. The throat chakra is also connected to one’s ability to hear, naturally as this is essential for communication. This area is also covered by psychic abilities of the third eye, as clairaudience will be enhanced by your communication skills! When we actually listen and reflect upon the words and expressions of others, we constructively respond with our own words and emotions. We can learn a great deal from this communication and understand ourselves better in terms of how we are viewed by the world. Sometimes these viewpoints will not be valid, as we should consider the source. But by using your intuition and ability to listen to your inner guidance, you will understand when the need to reflect upon listening is legitimate. Allow yourself to feel those emotions that you are expressing or someone has expressed, and then let it go! It will create so much more space for new, beautiful, and abundant opportunities in your life! Let your voice be heard and never underestimate your sense of self when expressing your desires, ideas and feelings! This is so important to keep our throat charka balanced and cultivate our communication skills. This will ensure our highest potential to ascend here on earth and cultivate a reality we absolutely love! Communication is essential! The best crystals for the Throat Chakra are Blue Calcite, Blue Chalcedony, Blue Kyanite, Blue Lace Agate, Celestite, Angelite, Aquamarine, Turquoise, Amazonite, and Blue Tiger Eye! The best oils for the Throat Chakra are Jasmine, Rosemary, and Sandalwood!